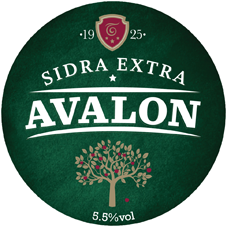 Avalon Sidra is produced by Spanish cider makers Trabanco – now in their 4th generation. They have picked up more than 50 international awards in the past decade. The Avalon brand name references the legendary Arthurian island of Avalon – Ynys Afallon – the place where King Arthur’s sword Excalibur was forged. Thus a link is acknowledged between Asturian and Breton cider making to that of the West County and the Celts. In the early 1990s Trabanco was one of the first companies to incorporate wine making practices, such as employing the equivalent of an oenologist, into cider production. The improvement in both analysis and method, such as helping avoid inadequate or excessive treatments, has resulted in acclaimed consistency and quality. Avalon is bottled unfiltered and is gluten free.